All sports feel odd, have to do everything backwards or find my own way of doing things. This is not welcome in team sports. Anything with a bat or racket. as above, when playing rounders, when I stood up to bat with left hand, opposition would often shout'leftie' causing fielders to change positions, which could occasionally put me off my game! Learning to fly fish was crazy. All this 10 & 2 business didn't make any sense till I reversed the clock in my mind to figure out what the right handers were talking about. One good thing came out of learning to fly fish. Because of all the knots you learn to tie, at the age of 37, I learned how to tie my shoes properly. Baseball, golf, because you have to reinterpret any instructions to the opposite hand which puts you behind. baseball, hitting a base hit you normally get out right away because the ball goes right to first base. Baseball, I hit right handed and use a right handed mitt. baseball, left hand-handed gloves are never available. My golf coach screamed "what's wrong with you, why can't you just be normal". baseball, never got comfy batting, wasn't sure how. No one to help coach me can't relate. Baseball, softball, tennis. Anything where you hold an instrument in one hand or the other. It is very difficult for right-handed instructors to help you with form. Basketball When I was on our school team I used to get the position wrong in holding the ball or to dribble the ball. Basketball, shooting the ball properly. Batting in softball/baseball has always been difficult because pitchers aren't used to pitching to lefties. Batting left-handed against right-handed people can be a challenge. After a hit, lefties need to turn around to run towards first base. Before I had my own baseball glove as a child, I always have to share with the other children. I'd have to catch the ball, drop the glove, throw the ball, retrieve the glove. Being left-handed made it difficult for both my volleyball and basketball coaches to teach me different skills. Being taught to bowl by right handers. Bowlers find it difficult to bowl to you when playing rounders. Bowling is hard because the only people to teach me how to play are right-handed. But I bowl right-handed too. Can't say-I learned whatever I did on the equipment that was available. could never play baseball, cricket, softball or teaball properly because I was never shown how to stand. and was given a left handed bow, for archery and was never shown how to shot with it because all the instructors were right handed. couldn't afford a left handed glove so /i would wear a right handed glove then have to flick it off to throw the ball after /i caught it. Did not left-handed golf clubs as a child. As a result I play right-handed. Don't like being singled out to be shown a different way to the others. I have trouble with tennis and golf. Don't really and didn't really do anything. During sports classes I always had to switch every movement the teacher explained. Each year in school we played a unit of hockey in Physical Education P.E. I always was the worst because I didn't know that you need a different hockey stick so I always messed everything up. every single one not previously listed. field hockey, had to hold the stick in my right hand and use those muscles more. Field Hockey, you are only allowed to shoot right because of the design of the stick and the rules of the game. Field Hockey. They don't make left handed sticks. Period. Once because there were so many lefties in my class the teacher got frustrated with us using the sticks backwards she dropped the whole unit. Floor hockey I absolutely hated in school. Football - I play badly on both feet, and I blame being forced to play right-footed. Getting people to bowl in the right place! Golf - very hard to borrow a set of left-handed clubs, I suppose I should buy some. golf- I had to get my own clubs as top golf never had the right clubs and I was always the one left to last waiting for them! GOLF!! And pretty much everything else, just because you have to take the gym teachers instructions, and then reverse them. golf. Always trying to get left handed clubs. Hockey because you can't hold the stick the way you want it to. Hockey was impossible as school didn't want to get Left-Handed sticks - had to go in goal every time as I couldn't play with a right-handed stick..
hockey, floorball, all tactic of teams are based in the right game of the team. hockey, I couldn't hold the stick properly. hockey, its illegal to use a left-handed stick, therefore they don't make them!! Hockey, you have to play right handed. Hockey. All the sticks are right handed. Hockey. Badminton/ tennis can be difficult as if there is a right handed person next to you the racquets often clash if you raise them at the same time. When we learn techniques for throwing events like discus or javelin, the teachers, who are usually right handed teach you how to throw from your right hand which can be a bit confusing. Hockey. Found it very difficult as an 11-year old to get to grips with the hockey stick. TO me a lot longer than everyone else to learn to hit the ball, as in a golf swing, because I felt I was doing it the wrong way round. Hockey. I know fully well there are left handed hockey teams - but alas there was never enough of us to play together at school so I was forced into some really weird position that left totally unnatural because I needed my dominant hand in control rather than the right that is normally used. Hockey. It's a right handed game!! I actually play some sports right-handed, some left-handed and some I'm fine with either way. I don't know if this is really a leftie problem, I just remember the occasional embarrassing ritual when trying a new sport at school and having to admit that I wouldn't know which hand I played with until I attempted it both ways. The teachers did always ask to find out if anyone was left-handed though and showed us how to play if we were. Actually, it used to be rather funny because in the baseball/softball kits there always seemed to be a disproportionate amount of right-handed gloves (ie, for the lefties so they could throw with their left hands). That meant that right-handers often got stuck having to wear one if they wanted to play. It was kind of fun watching them have to deal with it. I always had to adapt to the way the right handers played. Baseball is very difficult for me as I throw with my right hand but also catch with my right hand. This means that when I catch the ball I then have to quickly remove my glove and put it back in my right hand to throw it. I was never quick enough! I attempted kuk-sool-won which is a korean martial art and got told I would not be able to succeed because my brain is "wired differently"
I can not remember how to hold bats sometimes etc. I can use my right or left hand to throw balls and bat in baseball. I could never play hockey properly because the sticks were for right-handed people. I do golf and baseball right handed (hitting only) Once had a moped wreck due to left handed--controls on right, and I processed too slowly! I do Tae kwon do and during the patterns I am quite often the wrong way round. I don't actually play sports, but I feel like I am a better catcher with my right hand, but that is also the hand/arm I am better at throwing with, so soft/baseball definitely wouldn't be my sport! I don't swim in a straight line as my left hand is stronger than my right. In dancing I start out with my left foot/arm when everyone else starts with their right. I had a hard time with tennis. I had an instructor in high school that insisted that the only way to serve in volleyball was right handed. I was especially awkward. I finally asked to do it my way. Because I was able to pinpoint where my serve would go when using my left hand, he never again tried to change me. I was a cheerleader/drill team, that was nearly impossible because all routines started with the right and it was never routine for me. I learned all my sports right handed, because that is how the teachers knew. Not to mention that they never had leftie baseball gloves at school. I only learned to bat left handed after my school days were over. No coach would teach me to bat left handed. I tended to kick the ball with my left foot. Also I was never taught how to hold a baseball bat in my left hand. I tried to play golf once with a school group and was unable to comprehend why I couldn't hit the ball like everybody else. I thought I was just bad at it. So many years later I realize why that was. I was a terrible klutz in sports and had a hard time swinging a bat when playing softball. I was lucky one year to have a left-handed teacher, who supported me a lot. 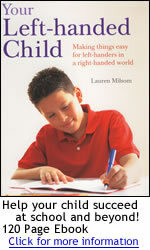 But often, a right-handed teacher is unable to explain certain techniques to someone who is left-handed. I was unable to pursue fencing at college as they only had right handed foils. After college I became interested in shooting - but the club I joined had no pistols with left handed stocks and were unlikely to get them because of cost v demand. I gave them both up. I wasn't taught by the school or GAA club affiliated with the school how to hold a hurley left handed. My mother had to show me how. I wasn't very good a sport over all any way. I went to play Polo once and was advised that you must play right handed. I refused and didn't play. Left Golf clubs are hard to find and must be special ordered. I'm not much for sports, really, but it's a lot of fun to throw people for a loop when they don't realise I'll be playing opposite them. In all sports, I use my right hand. It is the same way with tools. in cricket, or softball, I get the ball bowled to my right side, making it almost impossible for me to hit it. in games like tennis and badminton it is hard to get a rally going as I am always hitting back hand. In respect of coaching - coaches have forced me to play right-handed which is foreign and a strain on my arm. In school I took badminton (required) I would serve right handed because that is how I was taught and switched the racket to my left hand to play. I received a D just because I switched hands to play left handed. We then went into our golf portion and I was only given right handed clubs. I was told I would need to purchase left handed clubs if I wanted them. In softball being left handed prevented me from playing second and third base b/c the coach said it would take longer for me to turn and throw the ball. I had to teach myself to use both hands equally b/c quite often in a pick up game there are not left handed gloves. I learned how to be a switch hitter just to throw people off their game. In golf I have a hard time finding left handed clubs to rent. In some sports ie. cricket or golf can't decide which way to play left /right as you get taught one way but don't get an opportunity to try the natural way. In sports, I was told that left-handers should play right-handed (ex. holding a hockey stick, shooting a basketball) I see right handers using their right hands all the time for sports. In throwing events in athletics especially and in some other sports, teachers are unable to do the action as a left-hander would so you usually have to turn everything around. It is difficult to find equipment, especially in school (baseball mitts, ice hockey sticks, field hockey doesn't allow left-handed play at all). It is difficult to obtain some equipment like batting gloves etc Also some handles are shaped to suit right handers. It takes the coaches a few minutes to catch on when batting T-Ball. javelin, discus etc - the teacher couldn't demonstrate the opposite the hand, so I could never master the technique. Just being taught by teachers that can't demonstrate a sport the other way, eg tennis and rounders at school. My teacher at Primary school in rounders told me, "Don't hit the ball too hard as we don't have fielders over there" not good for a child's confidence! kept hitting the catcher with the bat after swinging for the ball in baseball. lacrosse & field hockey were more challenging. Rifle is much more complicated just finding the equipment. meeting other left handed bowlers is confusing because I'm so used to playing right handed people .Rounders is confusing too as the fielding team has to switch positions when I bat so I get confused with the layout! My brother taught me how to bat right because he said batting left was the stupid way. So now I bat right and throw left. All the throwing drills are completely backwards. Needed left handed mitts, which my father provided. Never know proper techniques because I'm always taught by a righty. No because I am ambidextrous however my friend who is left handed finds if difficult because the teacher demonstrates right handed and he just tells my friend to reverse it WITHOUT a demo! No one could show me proper techniques for lefties so I bat and throw right handed. Plus there were never left handed gloves for baseball. Not for Edward but Alice finds tennis a real challenge, she hasn't been shown how to use her racket left-handedly nor how to serve. However she does go rowing and hasn't found any difficulties yet. She isn't rowing in an eight yet, being left-handed may be of benefit then. Not good at sports period. Not necessarily more difficult, but maybe disadvantageous. for example, in softball the only infield position a lefty would ever play is first base, but in the other positions (besides pitcher), a lefty would be turned the wrong way after fielding the ball and would have to turn more/waste more time to throw it to first. Overall, being left-handed makes sports (and life) more challenging just because whenever a technique it demonstrated, it is usually done right-handed so a lefty has to mentally flip it around. However that's not to say that I haven't had some coaches would were willing to reverse it themselves to show me my (lefty) way. Note: Golf is harder to learn, but you can. OMG! ANYTHING tennis-related. Table tennis, badminton, tennis, wiffle ball, etc-serving the ball becomes a pain - even volleyball. Was always told to do it just opposite right handed people - and for that I never could. only when I am trying to learn for the first time from a right hander. Playing hockey and cricket at school because there were no left-handed sticks or bats!! playing racket sports like tennis etc. was a real headache because you would have play virtually all your shots on the back hand no wonder Greg Rudeski scores most of his points serving aces. Poor coordination, quite a clumsy person which I attribute to being left handed. Purchase of a baseball mitt. rounders - told to use bat in right hand, so it did not hit anyone in line! Rounders - wasn't allowed to use left hand - very biased. Rounders etc. as hit the ball the other towards 1st post making it easier for me to be caught out. rounders- if you don't hit very hard you hit it to first post! rounders, as you are batting straight towards first base! Rounders, because bowlers can never quite get the hang of throwing for a left hander, and blame us when it hits the body. Rounders, tennis, badminton, volley ball. Rounders, the always throw the ball the other side of me. Rounders. bowler always throws ball to my right side, making it hard for me to hit it, so I have to do'backhand' which does not work. school provide equipment for righties only, so in field hockey they only have goalie blocker for righties and force lefties to use their right hands for stick handling. Softball. Most pitchers couldn't pitch to me so I got hit with the ball a lot. Sometimes gear is specific for hands but this is rare. Sometimes I get confused because I play sports better with my right hand and I think my mind and body do not do the same thing. Sports where you need to bat or swing a certain way I am horrible at. sports with bats, racquets, etc. swimming was a little difficult at first. when I was being taught to swim they assumed that I was right handed and they taught me to breath on the wrong side. I kept swallowing water and choking, my mother had to tell them that I was left handed and not that it was because I could not grasp the concept of taking breathes while swimming. Taught tennis right handed - forced to play that way. Tennis and baseball, no one can serve or pitch to me. Tennis as I am often put with a right hander. tennis in particular as I never knew which hand to hold the racket in. In most sports lessons the teacher wasn't very helpful they just told lefthanders to do the same thing but backwards! Tennis, I am made to play right-handed. Also hockey, my wrists hurt from the way I have to hold the hockey stick. The teacher won't let me play left-handed. they do not teach leftys to play basketball, so I had to play right handed. too many to list. Swimming instructors always taught to breath when the hand you write with was at the back, however was taught to turn head to the right, which complicated the swimming stroke. Trying to play hockey right handed was a nightmare - it wasn't until we started playing 5-a-side hokey with double sided plastic sticks that I finally began to enjoy it'! Volleyball, Basketball, and Softball. All of my coaches were right handed so when they were teaching my teammates how to hit or throw or shoot I had to take what they were telling everyone else and switch the order. Pitching is difficult because everything is backwards and its hard to know if you are doing something wrong and fix it because everyone else is doing it backwards. When demonstrating canoe strokes I have to "think" opposite to the people I am coaching. When I started softball, the coaches spent a lot of time trying to figure out which arm I should throw with and whether I should bat left or right. When I started tennis, I was able to play either right or left-handed and it caused confusion trying to identify my dominant hand. When I was younger I had coaches in Basketball that expected me to do right handed things perfect even though I'm not right handed. when learning to bat when I was young, all my friends were right handed and no one knew how to teach me to hit left handed. Coaches do everything right handed since most are right handed. when playing American baseball in PE classes, hitting left handed put me in a position where I would hit the ball right to the first baseman. Whenever I'm shown how to hold a racket or bat, I get very confused and hold the racket or bat in an awkward position. While playing baseball or basketball, nobody could explain how I should hold my bat or ball.